The Rat-L-Trap is a bait that can be used in a variety of ways. The most common way to use the bait is what I call the basic “chunk and reel” method. Chunk it out there and reel it back in relatively fast hoping to trigger a strike from a feeding fish or generate a reactionary strike from a passive fish. If that doesn’t work, you can try slowing it down a bit allowing the bait to work a little deeper. Often this subtle little difference will result in more strikes. One of my favorite ways to use the bait is probably the most underused presentation of all, a yo yo retrieve. I use this approach when fishing the bait off of main lake and secondary points and around the edges of creek channels when the fish are not real active. Cast the bait out and let it fall to the bottom. Once on the bottom, quickly pull it up a foot or two and stop allowing the bait the flutter back down imitating a wounded or dying baitfish. The presentation of an easy meal may very well cause a non-feeding fish to go ahead a eat your bait simply because its there and its easy. The result, you catch a fish. Rat-L-Traps come in a variety of sizes, colors and styles. Some sparkle, some have spinners on them, some have a plastic bill on them for diving deeper, some float and others will suspend. There is so many, it’s sometimes hard to figure out which one to use. If you find yourself in this situation, like I so often do, go back to the basics. The ½ ounce chrome with a blue back, chrome with a black back or a gold with a black back are my standard baits. On cloudy days, early morning or late evening, I use the gold color. When the sun is bright, you can’t go wrong with the chrome. Last month I fished a BASS tournament at Sam Rayburn. The tournament was won on a Rat-L-Trap being fished over scattered grass (hydrilla). Several other anglers, including myself, caught fish on Rat-L-Traps in the grass. When fishing these baits around grass, you need to be using a high speed reel with a gear ratio of 6:1 or better on a medium action rod. 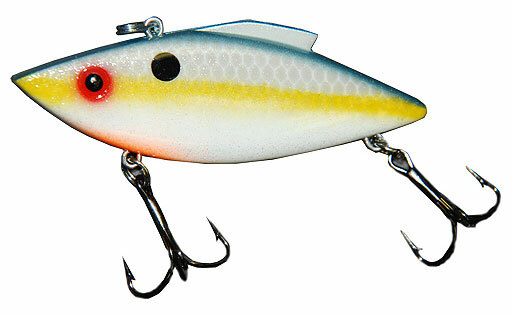 This will allow you to literally rip the bait through the grass triggering strikes. If the fish are aggressive, they will usually hit the bait just as you pull it loose from a snag in the grass. If the fish are not real aggressive, you may need to scale down to a ¼ ounce Rat-L-Trap in order to slow the bait down enough to get bit; yet keep it from staying hung up in the grass due to the slower retrieve needed to generate strikes. This is where having a variety of colors and sizes of baits come in handy. I really love fishing Rat-L-Traps over grass. The bait looks like the forage the bass are feeding on, a shad and the noise from the rattles inside seems to attract the fish even when they are buried up in the thick grass. When a grass bass hits the bait, it usually inhales the thing. Another bait to use over grass is the Red Zone Rat-L-Trap, it suspends. After cranking it down during the retrieve, you can stop the bait and it will suspend allowing the fish more time to see and strike the bait. You can also use it like a jerk bait while it is suspending, then continue the normal retrieve. This lure is also real effective on pre-spawn fish in creeks that are suspending between the creek channel and their spawning areas in shallower water. As a tournament angler, keeping a fish on after hooking it can mean the difference between making a paycheck and not making one. That’s why I always replace the hooks on my Rat-L-Traps when fishing a tournament. The hooks that come on the bait are ok for pleasure fishing or pre-fishing a tournament, but when it really counts, I want a good sharp hook that increases my chances of landing the fish. The next time you’re at the lake or your favorite body of water and you can’t figure out what lure to use to catch ole’ bucketmouth, remember the answer may have been sitting there all along. There’s a good reason everyone you talk to has a few in their box, the Rat-L-Trap simply catches fish. Until next time, enjoy the Texas Outdoors. We’ve come up with a basic guide that will help you choose the right fishing line for the job. Trying to make sense out of all the different types of fishing lines can be a bit overwhelming. We’ve made it easy for you to understand and we’ve even given our recomendation for each type of line that we’ve throughly tested and are confident you’ll be happy with.